This month 50 years ago, the famous backyard photographs were made by Marina Oswald. 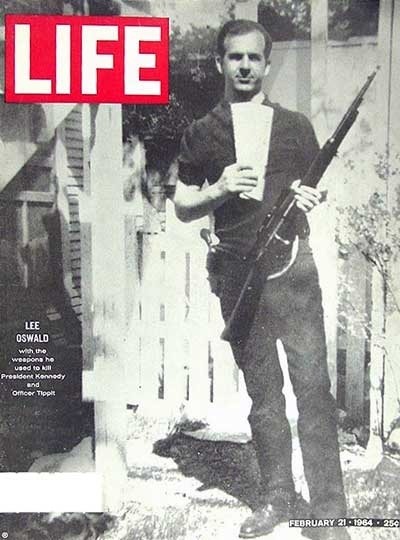 The photos show her husband Lee Harvey Oswald standing in his backyard, with a holstered pistol strapped to his waist, holding a Mannlicher-Carcano rifle and two communist newspapers, The Militant and The Worker. The authenticity of the pictures have always been the subject of discussion. After police arrested Lee Harvey Oswald on suspicion of assassinating President Kennedy, they searched the Paine residence in Irving, Texas, where Marina Oswald had been living. Among the belongings, Dallas Police officials found a brown cardboard box containing personal papers and photographs, including two snapshot negatives of Oswald standing in his backyard. Highly incriminating pictures: the rifle he was holding appeared to be the one used to shoot Kennedy. Oswald himself, when shown the photo in jail, claimed he had never seen it before and insisted someone had superimposed his head onto another body. Marina immediately recognized the photo, that became Warren Commission Exhibit 133-A. Lee and Marina Oswald lived in this upstairs apartment. This is the location in Google Maps and here is a recent picture of the backyard. 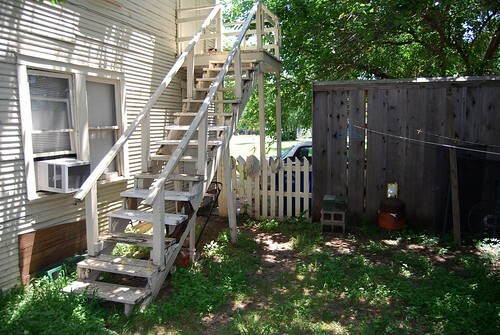 Late in the afternoon, most likely on Sunday, March 31, 1963, Oswald descended the back stairs of this house, carrying his just purchased rifle. He was very proud of it. He handed his wife a camera and asked her to take pictures of him with the weapon, the revolver he already owned and the two left-wing newspapers, dated March 11 and March 24, 1963. One of the photographs later appeared on the cover of Life Magazine in February of 1964, on the front page of the Detroit Free Press, and soon in various other publications. But what happened? The photo appeared to differ from publication to publication. In particular, details of the rifle differed. Why did they tamper the picture? Among lots of critics, the differences created suspicions that the photo was fake. Skeptics still continue to argue the photo was fake, noting apparent inconsistencies in the shadows, conflicting body proportions, and a strange line across Oswald’s chin suggesting the head may have been pasted into the photo. Are they right? And why in hell were multiple versions of the same photo circulating in 1964? Lyndal L. Shaneyfelt, an FBI photographic expert, performed an analysis on the two backyard prints. (…) Shaneyfelt examined them under magnification andnfound no characteristics of compositing or retouching. Initial public controversy regarding the authenticity of the backyard arose after copies of CE 133-A, which appeared to differ in detail from the original as well as from each other, particularly with respect to the configuration of the rifle, were published in Life, Newsweek and other news publications. He testified that the apparent variations in the magazine versions were caused by retouching, a common practice the reproduction of photographs for publication. Case closed – but not to all people. Some still think something is wrong with this pictures. Watch, for instance, some movies on this subject on YouTube. Thanks for your comment on this article! Didn’t Marina confess that she took the picture? Have to look into this, has been a while ago. I don’t know if these photos are altered, but honestly, I’m skeptical. Which doesn’t mean that I think Oswald was a lone assassin. I think you have to look at who provided Marina with the translator (connected to Jack Crichton – military intel background), who knows what she really said. THE JFK COVER UP.. WAS A SHOOTING..
WHY DO YOU ALL AVOID THE OBVIOUS?? Imagine yourself as a young 22 year-old, being raised to believe that the government is “the good guys” and they’re telling you that your husband murdered the president. Did you bother to look at the differences in the photos? Do you really think the fraud in those photos is the work of pro-Oswald people AFTER the fact? Isn’t that ABSURD to even consider? Women are emotional anyway and I’m sure her emotions were in an upheaval. Even if she said she took the picture *when she was in such a state* doesn’t address the fact of how easily she could have either been pressured or simply that she never noticed the fabrications of the photo. If the police brought you a photo of your husband in the backyard of his apartment, and said, “Did you take this?” would you give the photo a forensic examination before answering, if you were a 22 year-old female immigrant with two small children whose husband was accused of such a crime? Do you not think that she was extremely afraid of what they might do to her? Do you not think that she might have lied about many things just to try to appease the AUTHORITIES? You know that she’s changed her testimony. Having the CRIMINAL FBI announce anything to the public about JFK’s assassination makes it QUESTIONABLE, not credible. The fact that it’s 50 years later and the lies are STILL being perpetrated by the media says a great deal. Is it not common knowledge now that J Edgar Hoover hated both Kennedy’s and knew his job was on the line and wanted them both gone, which btw, is exactly what happened (because RFK would have opened a new investigation into his brother’s death). Is it not common knowledge by ALL who know anything about the Secret Service protocol that MANY RULES WERE VIOLATED THAT DAY and that upon hearing shots, INSTEAD OF RACING OFF, Kennedy’s driver SLOWED DOWN? How much clearer a message could that be? You need to make up your mind what you believe and name your website appropriately. If you’re going to ride the fence for the sake of $$$, then I’ll have no respect for you. The evidence on the Internet is MORE THAN ABUNDANT that the Dallas PD, the Secret Service and the FBI were ALL PARTIES in hiding the truth from the public in their EFFECTIVE PLAN TO STOP JUSTICE FROM OCCURRING in the aftermath of Kennedy’s assassination. Kennedy was not murdered by Oswald; that is ludicrous. Oswald’s history was a setup by the government to use him as a patsy. No one goes to Russia, renounces their US citizenship, offers secrets to the Russians and then just waltzes back in with the ease that Oswald did without government authorization and approval. If these charges of which Oswald was accused were true, the FBI would have met him at the airport and taken him directly to jail and he wouldn’t have been an available patsy. The holes in the government’s “stories” have been exposed and are too many, too detailed and have too much evidence THAT THE MAJOR MEDIA WON’T ALLOW TO BE SEEN for any honest man to believe the con that the government has sold us. The evidence against the government’s story is MASSIVE and convincing to any HONEST MAN. The Warren Commission was hand-picked by LBJ of men who DID NOT LIKE Kennedy and that it was a farce, a fabrication and a fraud is obvious on TOO MANY POINTS, again, for any honest man to deny. Examine the history of the men yourself and note, not only what Kennedy did to Dulles, but what position his brother held when Kennedy was assassinated and why he was never mentioned. Anyone who claims they believe the government on Kennedy’s murder is ignorant or a liar. There are no other options. NOTICE ALL THE RUSSIANS IN CIA…. NOTICE EX CIA ARE PRESIDENTS…. NOTICE DEMOCRATES DIE…REPUBLICANS LIVE…WHAT REPUBLIC DO REPUBLICANS REPRESENT??? THE SOUTH??? AND SLAVERY??? REPUBLIC OF USA…. I AM SO TIRED OF USA LIES…SEEMS AMERICANS CANT TELL RIGHT FROM WRONG ANY MORE. ITS NOT RIGHT TO MONITER AMERICANS UNLESS YOUR A MILITARY COMMUNIST GOVERMENT…. 2015 is the year the communist , 2000 yrs ago they took over ROME AND KILLED CAESAR AND JESUS…. USA DOES RUSSIAS DIRTY WORK…. THEY BOTH PLAYED THE AMERICAN PEOPLE WITH CHINA AS 3 TOP NATIONS UNITED…. TURN OFF YOUR MEDIAS, WHY DO YOU THINK ITS OKAY TO WATCH LIARS AND ELECT THEM??? YOU VOTE FOR FRAUD… REPUBLICANS ARE TRAITORS FOR OVER 50 years… DEMOCRACY DIES, COMMUNISUM GROWS, learn from chinas people…. Here’s a possible plausible scenario, old Marine buddy runs into Lee Oswald in early 1963. Lee takes a couple photos of his friend holding up a gun and newspaper. Lee gets film developed, is bored at work one day, and superimposes his face over Roscoe White’s. Figures himself clever and gives one to White and one to DeMorenschildt, and keeps one for himself. Maybe before, he did try to get Marina to take a photo of him like that and maybe they didn’t turn out so good if at all. I think DeMorenschildt was filling his head with how evil the right wing fascists were and what a threat they posed to the country. Oswald fancies himself a “hunter of fascists” and takes a shot at the biggest one in Dallas…Gen.Edwin Walker. This photo is used later to further incriminate Lee Oswald after being accused of shooting the President. Does anyone know what Roscoe White was doing or where he was working in early 63 before he joined the force in Oct.63? AS FAR AS I KNOW, CERTAIN KEY PLAYERS IN THE JFK SHOOTING ILLUSION THAT WAS A CIA COVER UP, WERE PART OF A CIA SMUGGLING OPERATION THAT GOT BUSTED AND COVERED UP BY CIA…. THE JFK COVER UP IS THE SHOOTING, OSWALDS A FALL GUY, AMERICAN PEOPLE ARE THE PATSIES….CIA MEDIA EVEN CONFUSES UP THE PUBLIC…. Jack white, a photographic expert, has shown why the photos are fake and has reverse engineered the method by which they were faked. You can find his presentation on YouTube. The Oswald face is identical in all the photos. It is impossible to take three photos of a face with a hand held camera and have the images come out identical. You can overlay them and they match up exactly. You can clearly see the line across the chin where the Oswald’s chin becomes that of another man with a wider, square chin. Oswald’s chin was sharp and had a cleft. The proportions of head to body are wrong from picture to picture. The background image is identical from shot to shot. The background was “keystoned” a bit in the compositing process to force the perspective to make them appear different. A high quality composite image was created first, then photocopied using the cheap camera that is supposed to have belonged to Oswald so that the negative frame and scratches, etc. would match. The photos are absolutely fake. Michael Paine lied when he said Oswald showed him one of the photos. Oswald didn’t know they existed until he was shown one while in police custody. This puts the testimony and actions of the Paines in a suspicious light. It was Ruth Paine who called Lee’s attention to the job opening at the Texas School Book Depository. It was Ruth Paine that claimed to have seen the rifle in her garage. Marina was in a precarious position after the assassination and would have said anything she was told to say. The fact that the photos are fake coupled with Michael Paine’s lie about Oswald showing one of the photos to him, proves a conspiracy to frame Oswald. It looks like the Paines and George DeMohrenschildt were in on it. I know this is an old article but I am currently doing a report on the JFK assasination for my thesis. I must agree that it has been decades and anyone can alter those pictures. But the technology was not really there around that time to alter pictures this good and if this is an edited picture it must have take a lot of time to do it.